By now, we all know and love HQ Trivia, the live trivia game that everyone is obsessed. Playing HQ Trivia is the most exciting part of our day. It really makes both work and after work worth staying awake for. HQ Trivia a group activity — you can play it with your co-workers or with your family. Or, you can totally google the answers and play by yourself. Just kidding, it’s actually seemingly impossible to google the answers. Not that we’ve tried or anything. But some of those questions are complicated! They really make you think. Speaking of, let’s talk about just a few of the many things we think about while waiting for HQ Trivia to start. And let’s be real — it usually takes a while to start. Looking at you, Lag Daddy. 1. How did I even come across this app? 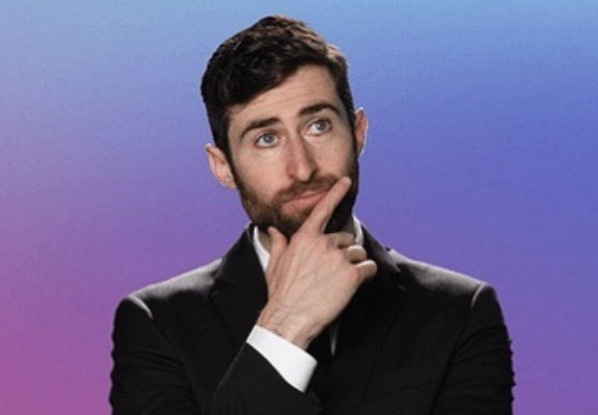 It’s so weird to think about finding HQ Trivia, and even funnier to think about how big of a deal it is now. How did my friends get me to download this app? Am I going to lose all of my money? How long will this take? But once you’re into the swing of it and you’re playing HQ Trivia twice a day, eagerly looking forward to those game time notifications, you’re an old pro. I love these 15 minutes of my life. I’m happier for the winners than I am for my friends who are getting engaged right now. I miss Scott when I’m not playing HQ Trivia. 2. Scott Rogowsky, I really love you. It’s so true! Scott is great. Is Scott going to host today? I hope Scott hosts today, even though the guest hosts are pretty funny sometimes. I like Sharon. She seems so genuinely bummed when people get the wrong answer. It’s nice to mix it up, because Scott deserves a day off. The other hosts add some excitement to the twice-a-day trivia-thon. It’s fun to mix it up, but ultimately, we’re the happiest when our fate is in Scott’s hands. It also doesn’t hurt that he’s so handsome. Scott is our friend now. We even notice when he gets a haircut. We’d just love to be shouted out at the beginning of the game like the other random players in the chat. 3. Speaking of, the chat is nuts. My WORD there are a lot of Star Wars spoilers in here! Some of these can’t possibly be real. Hoo boy, the chat is brutal. Truly, if you don’t want to know what’s going on in a new movie or TV show, swipe away the chat. If you don’t want to see lots of people sharing their opinions on the President, swipe away the chat. And if you don’t want to be berated with referral codes, swipe away the chat! Snape kills Dumbledore? Oh, come on, people. A ten-year-old spoiler still hurts. Seriously, the chat is so weird. There are also a lot of people who think Scott is trapped inside of the app, which we are pretty sure isn’t true. (Scott, are you ok?) But we will say, the chat is really good for jokes about HQ Trivia’s ongoing lag problem. “Lag Daddy” is the best nickname for Scott, and it was most definitely invented in the chat. 4. Scott’s nicknames are the best. “Lag Daddy” is great, but what about the rest of those nicknames? Did Scott name himself “Quiz Khalifa”? Are you allowed to give yourself nicknames? “The Trap Trebek” is so silly, but kinda catchy. Do you think Alex Trebek has ever played HQ Trivia? Do you think he’s against it? Do you think he’d win every game if he did play? Is Alex Trebek even good at trivia, or is he just charismatic? This app has us thinking about other game show hosts way more than ever before. 5. Today’s the day we’re going to win. Every time HQ Trivia begins, it’s the same ol’ discourse in our mind. We hope we win today, we chant over and over. Today’s the day. What a rush that would be! The prize money is just so much these days that it feels like playing the lottery that we have just a little more control over. What would we spend our money on? A new iPhone? A manicure? Maybe a cup of coffee, depending on the size of the haul. The only way it seems like you can win is if you have an extra life, which reminds us — we haven’t asked each of our cousins quite yet! We wonder who we could get to use our HQ Trivia referral code again. Maybe we can reactivate our old iPhones and use our own codes? No, no. That’s not a thing. 6. Please, Scott, just ask me a question that I know the answer to. Each and every time we play HQ Trivia, we pray for a Titanic question. Or a Parks and Rec one. And nothing sports-related, and nothing about oceans or history or software development. Just please, please give us one question about pop culture that we definitely know. Or 12! 12 questions we definitely know would be great, thanks. 7. How do they afford any of this? When do you think HQ Trivia will start advertising? They gave away SO much money during the holidays! How can they afford that?! Why didn’t we get any of that? What a Merry Christmas it was for some people! 8. The music is the best. Let’s have a moment of appreciation for the HQ Trivia theme song. We LOVE the HQ Trivia theme song. 9. HQ Trivia is overwhelming. Literally. Why is the app always SO. DAMN. LAGGY. Hmm, maybe because hundreds of thousands of people are playing at the same time. We love you, Scott and HQ Trivia, lag or not. Thanks for being here in our lives.